LAS VEGAS, NV, (Oct. 14, 2018) - The debut of the all-new Fight Dome Las Vegas delivered an explosive night of fireworks at the Rio All-Suite Hotel and Casino on Friday night. "FFC 31 Night of Champions" was certainly a night to remember. "The Scorpion Sting" Mladen Brestovac delivered the knockout of the night, with a blistering high left kick to the head of Jhonata Diniz at the two-minute mark of Round 3. 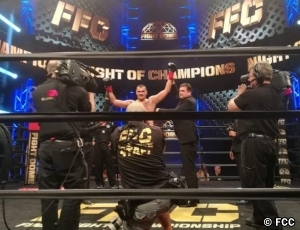 Shkodran "The Albanian Warrior" Veseli (83-18-1) won the FFC Welterweight Kickboxing Title with a 4th Round KO stoppage vs. Francois "Bang Bang" Ambang (18-8-1). A series of solid punches from Veseli rocked Ambang and sent him to a kneeling position at the 1:23 mark of the Round number four. In the boxing portion of the evening, Shawn Miller, of Troy, NY (19-4-1) won a unanimous decision victory in his ten round title fight with Dennis "Mongoose" Morris (14-3-1). Miller won by the scores of 100-90, 97-93, 97-93, earning him the WBU Cruiserweight Championship. In the FFC MMA Welterweight Championship, Ben Egli lived up to his reputation as an expert submission artist by choking out Roberto Neves at the 3:21 mark of the first round. Egli won the fight by rear naked choke, something he has done a total of five times in his pro MMA career. The championship victory brings Egli's record to (11-2-0) while Neves falls to (10-3-0). "FFC 31 Night of Champions" was broadcast live on CBS Sports Network and the event made history as Final Fight Championship, one of the fastest growing combat sports promotion companies in the world, became the first promotion company to hold a multi-discipline event (Boxing, Kickboxing and MMA) in Las Vegas history.